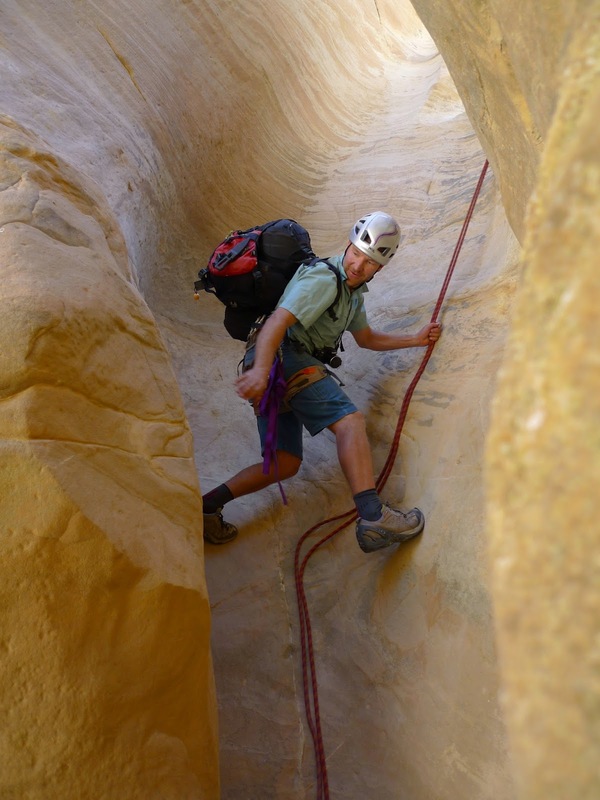 Back to that random-off-the-couch adventure stuff I like so much - this one took place in Moab back in the Spring. 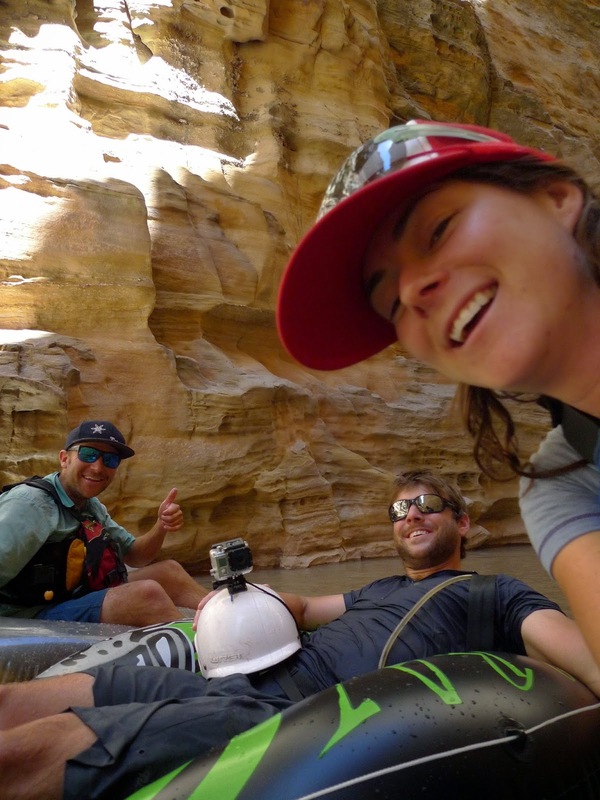 With only one free day to feel a sense of achievement and exhaustion the Utah adventurers recommended a biking-canyoning-rafting multi sport triad. 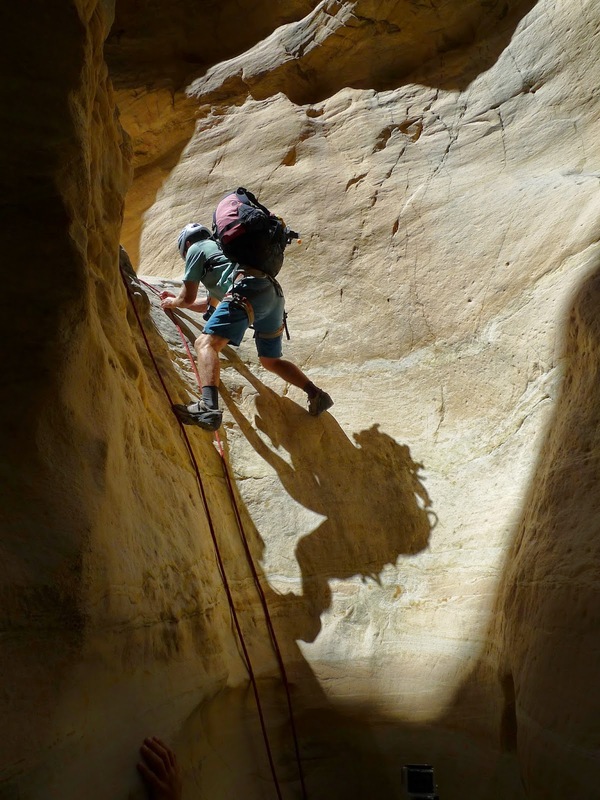 A 4am start saw us heading, with sleep in our eyes westward, into the San Rafael Swell. The Swell, as Mr. Benson might tell me is a pretty unique Precambrian dike that suffered faulting, pushing the overlying rocks into an anticline. That description sounds like a typical day at my office and not all that unique, but the area is certainly cool. After warming up for the day on the bike portion, the bikes were strategically placed under a tree (with Mr Bensons carbon one on the outside to deter thieves from my cheaper stead), we began the descent into the to the rocks via Music Canyon. 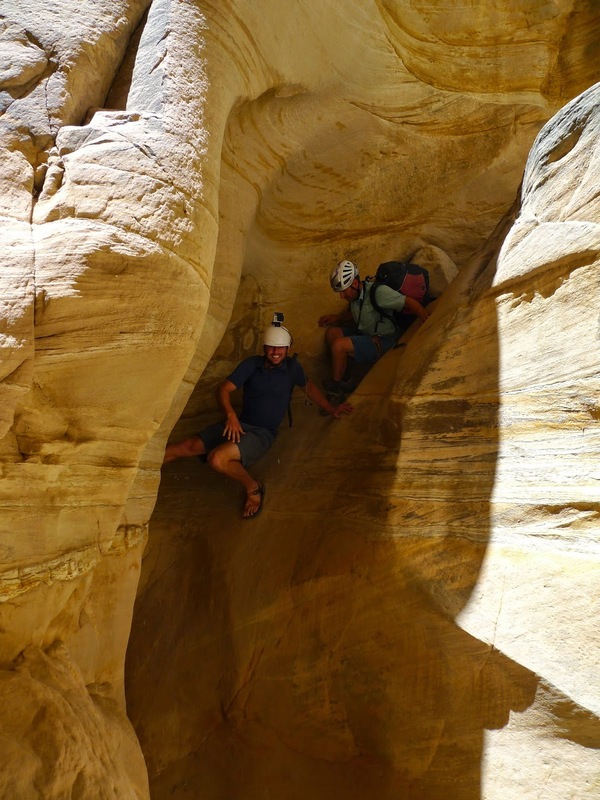 Canyoneering: Music Canyon was my first canyon adventure without students, but the same magic remains: there is a mystery in going into the Earth, you get to move through its wrinkles and see the building of it centimeter by centimeter. The descent gradually steepened going from walking to scrambling to down climbing, eventually the echoing chambers gave way to the sound of river. 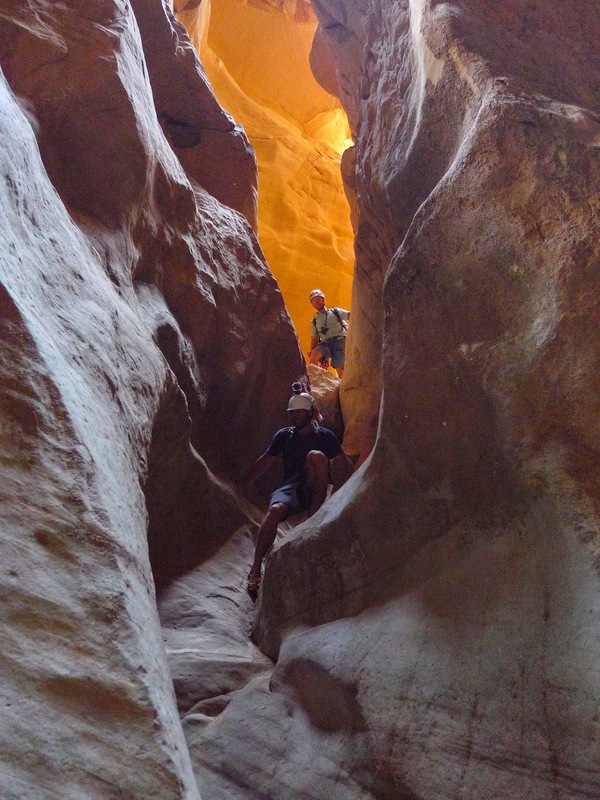 Muddy Canyon: The Chute is navigable above about 100cfs, and we hit it about 101cfs, probably one of the few days of the year it is running. Our group was well supplied with technical gear for the descent. We had one break down paddle, one packraft, and two large pool toys. The packraft acted as the support boat for the expedition and stood up admirably to the rocky decent. This one was made by NRS and I can see the opportunities that open up with the we boats that weigh less than 5lbs, and can be carried in the bottom of a pack. 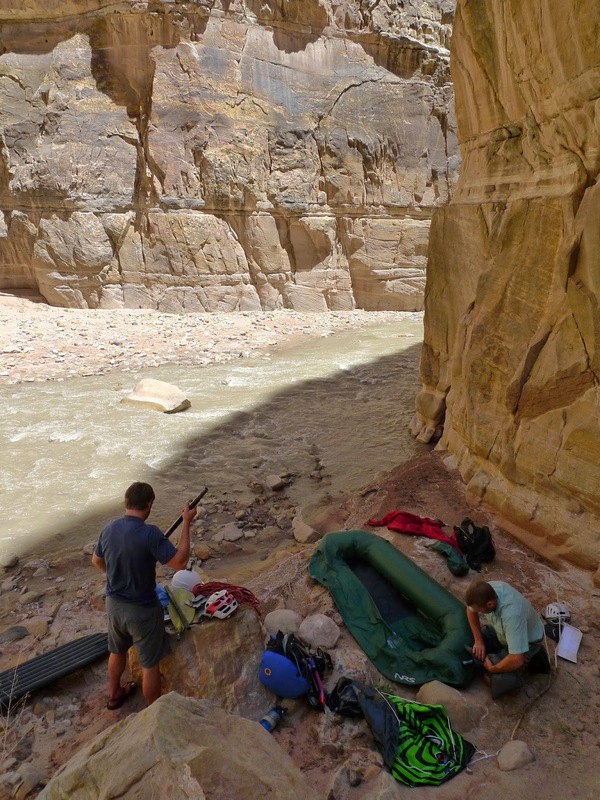 Eventually the channel moved slower and shallower so we shouldered the inner tubes, deflated the raft rolled it all up and hoofed it miles back to the vehicle completing the circuit in a solid 12-14 hours. Back at the car we squeezed into the small sliver of shade cast by the truck and enjoyed warm beer and super hot salsa. An awesome multi-sport day. 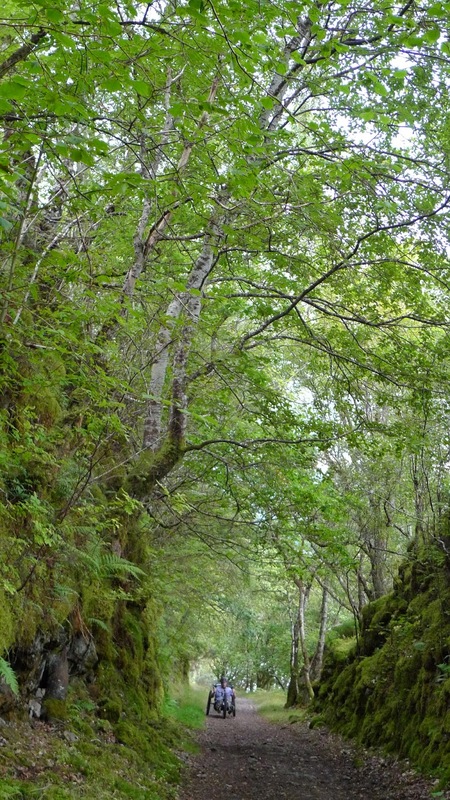 The Great Glen Way is a hodge-podge of traditional Scottish travel routes containing tow paths, drove roads, single-track road and trail, railways, old military paths, and Forestry Commission roads. 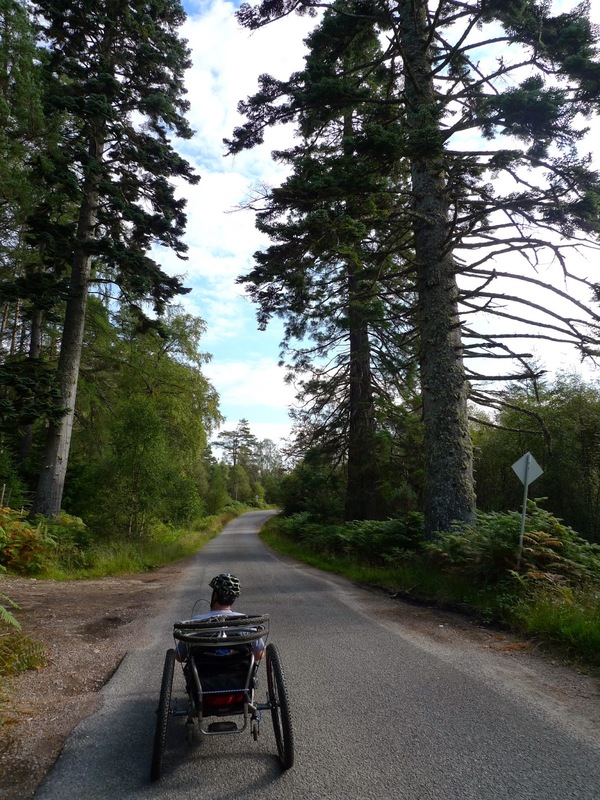 The path runs through the Highlands from Fort William on the West Coast to Inverness on the East. Leaving from Fort William. Vic with her shopping bike and Jack the man who made it all happen. 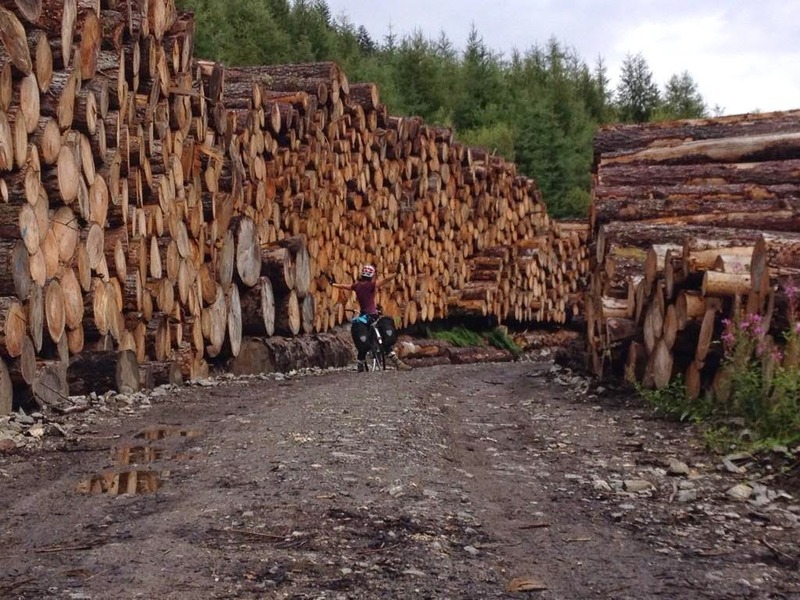 The initial plan was to spend five days cycling, camping, and eating at pubs. On Day one we followed the Caledonian Canal for fifteen miles with a detour to Spean Bridge for fish and chips and a pint. Neptune's Staircase. A series of eight locks along the Caledonian canal. It was a real treat to eat wild brambles throughout the ride. 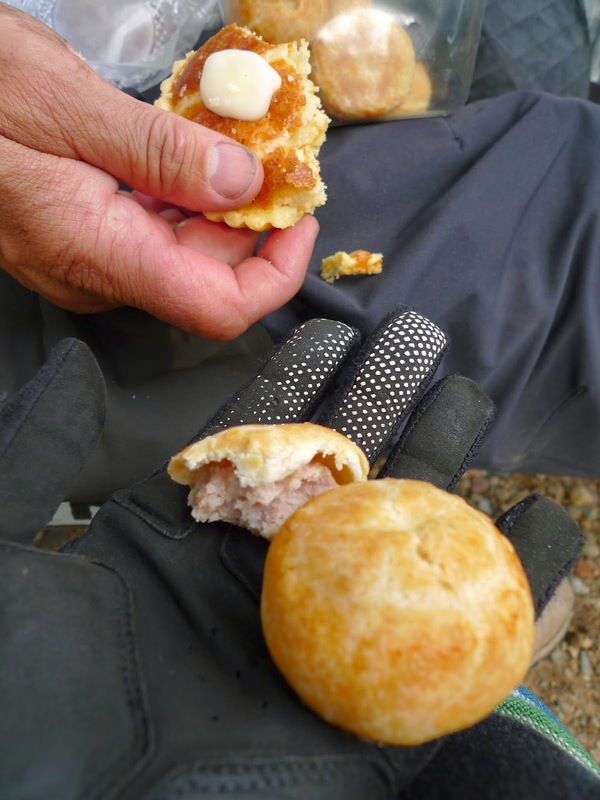 Pork Pies and Bakewell Tarts, perfect road food. Day two we camped along the canal with a group of Finns walking the GGW. The "informal" camping was free and well maintained and open to all boaters, hikers, bikers, and horse riders. The middle sign reads "You are entering remote sparsely populated dangerous mountain country. 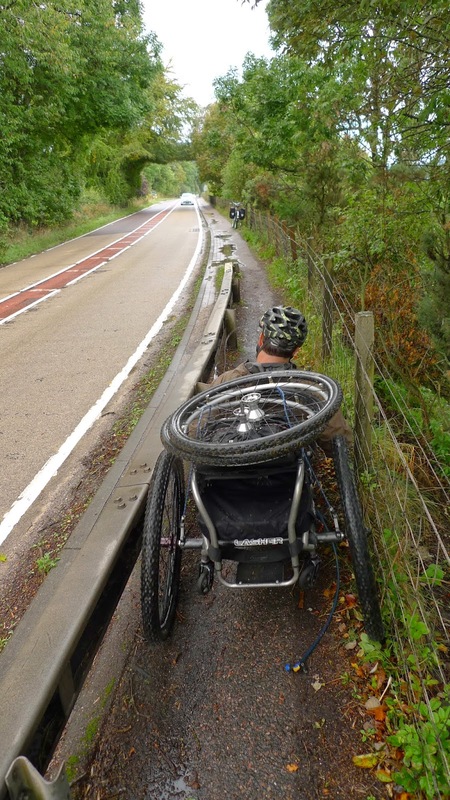 Please ensure you are adequately experienced and equipped to complete your journey without assistance." 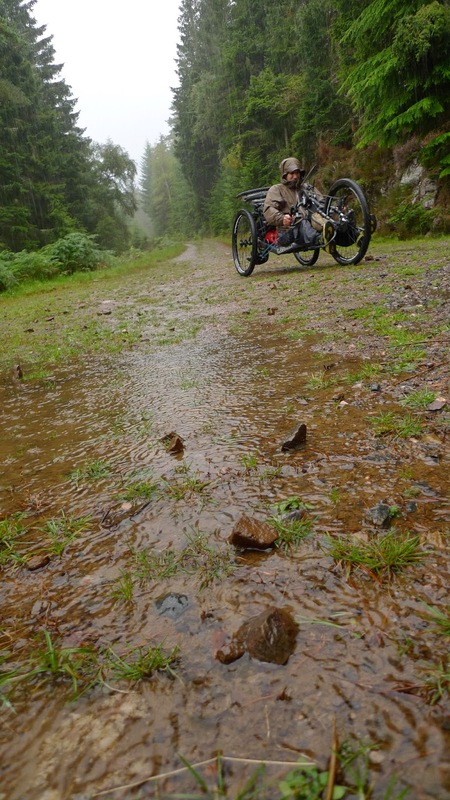 The Great Glen Way has been travelled for centuries. The geological fault that runs nearly coast to coast has four lochs linked by the Caledonian Canal which is the engineering genius of Thomas Telford. After a rainy day four we stayed at a hostel in Drumnadrochit along Loch Ness, the home of Nessie. More fish and chips were required to fuel our finely tuned bodies for what we hoped would be a final push into Inverness. The beginning of day five was two miles of pushing on uphill single track that was so slow we realized another day would be needed to reach Inverness. 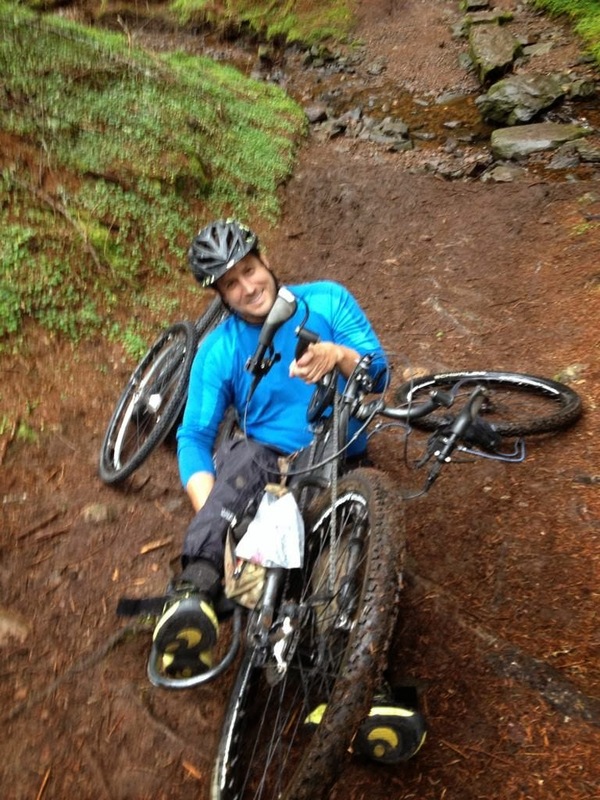 That extra day was ultimately not needed as Mike's wheel sheared off and we were forced to hike out and find help. Luckily, about three separate parties did their good deeds for the day and got us to Inverness where Vic's dad met us to take us home to a warm, dry bed. 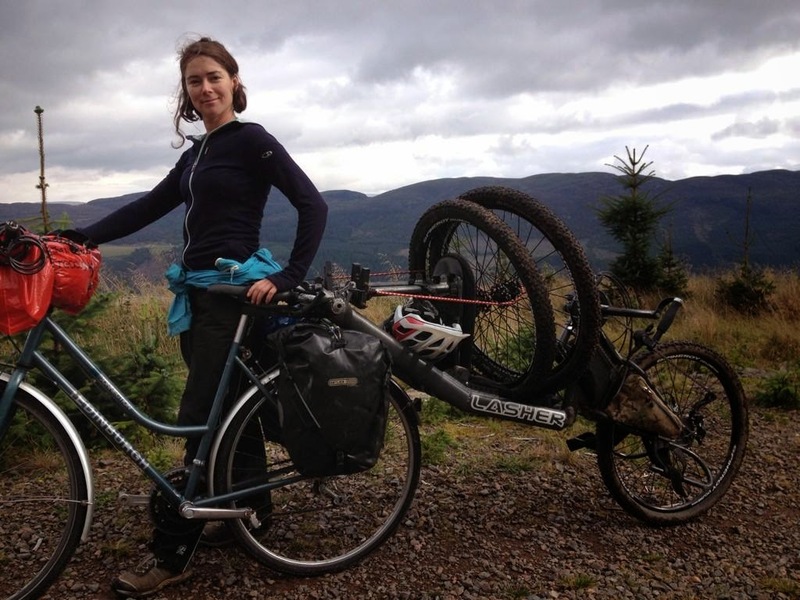 Vic's shopping bike turned cargo hauler. At first we tried putting Mike's bike on the front, but that was a steering disaster.